Adding anti-fatigue mats under standing desks can encourage use. Trying to have a more productive workforce? You might want to encourage your employees to get on their feet. There have been a lot of studies around standing desks and the impact they make in the workplace. However, new findings suggest in addition to giving employees a break to stretch their legs, they could boost overall productivity. According to the Independent, a recent study found that when workers reduced their sedentary time by 80 minutes per day, they were more engaged with their work. The news provider reports that people who work in an office spend up to 70 to 85 percent of their day sitting, which not only has been attributed to health problems, but can cause back and muscle pain. It’s important to encourage employees to stand when they can. Healthline reports that standing helps increase energy levels throughout the day. However, sometimes standing for long periods of time can seem strenuous to people, so it’s important to offer accommodations. 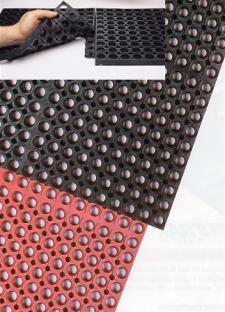 Anti-fatigue mats provide a cushion that can help ease the pressure put on joints and the feet from standing. These rubber mats can be placed right under the standing desks and create a comfortable space for people to stretch their legs and get their work done.